Later, at the Kennedy Meadows campground Cheryl met Ed and fellow hikers and was touched by their hospitality. (Of special note, past and present thru-hikers now know Ed as the legendary trail angel Meadow Ed, “amateur poet and seasonal vagabond.”) At the campground, she also got rid of unnecessarily heavy gear and learned how to use an ice axe in anticipation of the snowy conditions ahead. 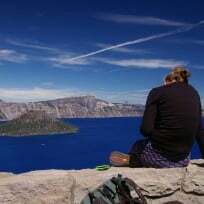 Soon after, as she hiked into the Sierra Nevada mountains from Kennedy Meadows, Cheryl felt suddenly aware of the “world’s vastness.” She hadn’t, she writes, “even understood how vast a mile could be – until each mile was beheld at walking speed.” Indeed, the miles of the PCT in the Sierra Nevada offer a unique opportunity to feel the vastness of the wild and to savor the peaks’ sparkling light as it reflects off snow, ice, water, and granite combined. 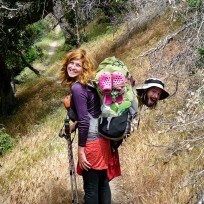 She would rejoin the PCT at Sierra City to hike alone once again. 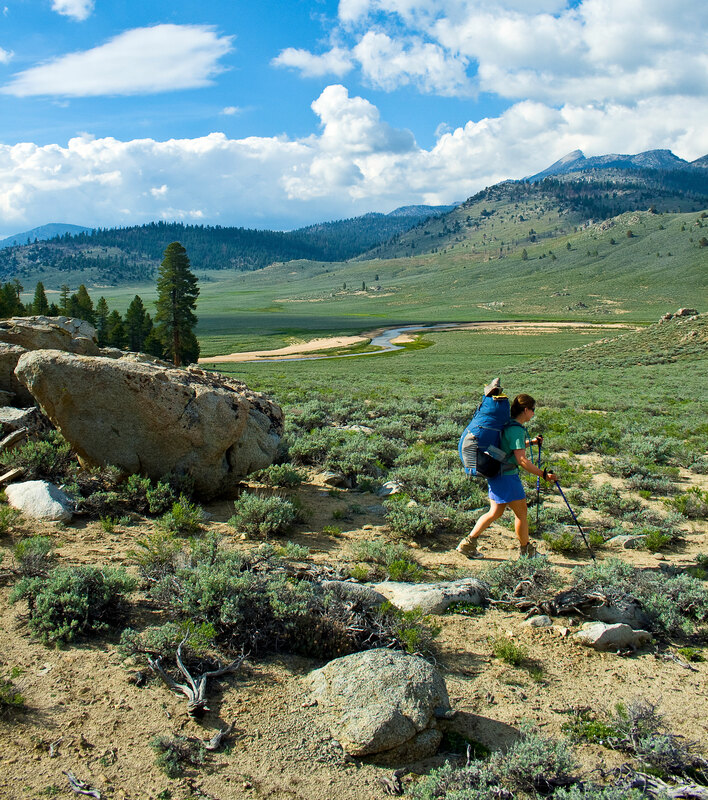 The Kennedy Meadows trailhead and campground is a good place to begin a trip into the Sierra Nevada because the PCT’s steady ascent northward allows you to acclimate relatively slowly to higher altitudes. 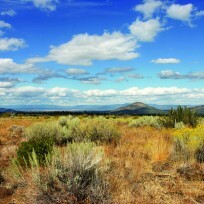 Backpackers will want to experience the southern Sierra Nevada on this beautiful stretch of PCT. 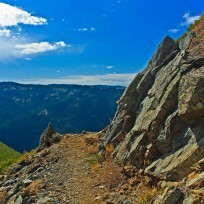 Over 40 miles (starting at Kennedy Meadows), you climb from about 6,150 feet to 10,500 feet at Trail Pass. Along the way you cross the rushing South Fork of the Kern River, encounter your first Sierra meadows and catch glimpses of snowy High Sierra peaks. Once at Trail Pass, it is a moderate two-mile descent to Horseshoe Meadow trailhead, which is about 20 miles on paved roadway from the town of Lone Pine, California. 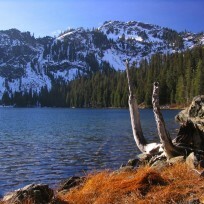 Alternatively, one can continue about six miles north of Trail Pass and about one mile past Cottonwood Pass to Chicken Spring Lake, which offers great campsites at the base of Cirque Peak. 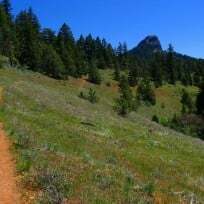 Exit the PCT to Horseshoe Meadow via four-mile-long Cottonwood Pass Trail. For a day hike option, head north from the Kennedy Meadows Campground until you’re ready to turn around. It’s 1.9 miles each way to the bridge over the South Fork of the Kern River. It’s a great spot for a lunch and a swim. 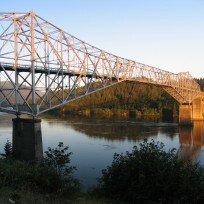 You’ll be amazed by what you see at the bridge. We’re keeping it a secret. 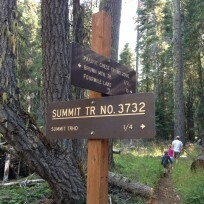 Distance: 40.6 miles on the PCT to the Trail Pass Junction, one way. 1.9 miles each way to the South Fork of the Kern River. Trailhead driving directions: Kennedy Meadows campground and trailhead lies at the end of Kennedy Meadows Road, 24 miles from U.S. Highway 395, and another 25 miles from the desert town of Ridgecrest, California. The road is paved. Permits: A wilderness permit and a California Campfire Permit are required. Special regulations: Dogs are allowed on leash. You must properly protect your food, including placing it in a bear canister if you enter Sequoia National Park. During dry years, and always at high elevations, fires are banned.